In today’s episode, Andrea and Eric are joined by Steve Taylor, the team 3DMJ Registered Dietitian. What the process is like for becoming an RD. What sets an RD apart from a “nutritionist”. And how Steve has found his professional training to be helpful when working within the fitness industry. 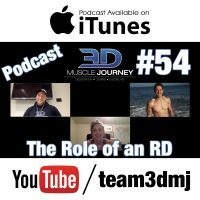 Along with answering the above questions, the group also talk about Steve’s role with 3DMJ, his personal journey to becoming an RD and joining the team, and advice for those considering becoming an RD on how they can maximize their experience.